The first African swine fever (ASF) case was discovered in Kenya in 1909. By the end of 2018, more than 40 countries around the world have reported ASF outbreaks. In August 2018, ASF was first reported in Liaoning Province, China. From genetic analysis, the virus strain was closely related to those in Russia, the border of which is only 1,000 kilometers from Liaoning. Since then, China has become the first country in East Asia to report ASF outbreak. From August 1 to December 20, 2018, 23 provinces and municipalities in China have reported cases of ASF. 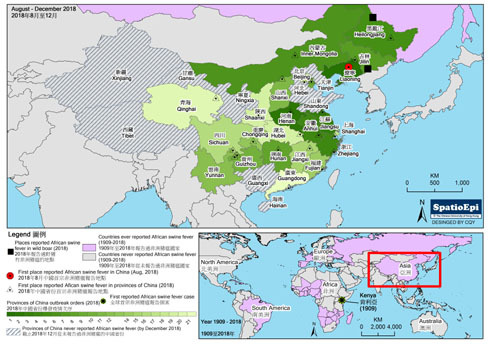 Guangdong province, which is closest to Hong Kong, also reported ASF virus infection in December. As shown on the graduated color map (as of December 20, 2018), the outbreaks started from the coastal provinces, and then moved to the inland provinces. Besides, the virus was found in wild boars in Heilongjiang and Jilin province. More than 200,000 pigs in China are suspected to be infected. To control the outbreaks, the Chinese government has slaughtered and disposed pigs infected or suspected to be infected properly, cracked down on the illegal hog slaughtering, and built more large-scale slaughterhouses. Countries near China have made strict import controls, and forbidden passengers or residents bringing Chinese pork products to their countries. The map data are from the World Organisation for Animal Health (OIE). What is African Swine Fever? 什麼是非洲豬瘟? African Swine Fever (ASF) is an infectious disease in the pig family caused by a DNA virus called ASF virus (ASFV). Infected pigs have a series of symptoms and signs: high fever, loss of appetite, hemorrhages in the skin and internal organs. After infection, pigs usually die in 2-10 days. The routes of transmission of ASFV in pigs include: eating contaminated pork products that are uncooked or undercooked, exposure to infected pigs. Ticks are an important vector for ASFV transmission. Is human susceptible to ASF? 人會感染非洲豬瘟嗎? ASF has remained a disease of the pig family. Human is not susceptible to the virus. Currently, effective vaccine or treatment against African Swine Fever is not available. People can maintain a tick-free environment for pigs and do not feed them with uncooked or undercooked pork products. Also, people should isolate and slaughter the infected pigs, followed by cleaning and disinfecting the site.